My younger boys’ bedroom has been in desperate need of a makeover for awhile now. The beds have gone from bunkbeds to singles and back and forth several times. We’ve envisioned several different makeovers, designed a new room in our heads, taken all of the artwork off of the walls…and then life gets busy, and the project gets put to the back burner again for awhile. Eventually the kids started hanging up their own posters and artwork again, and once again their room has become a hodgepodge of different styles (or lack thereof!) and colors. 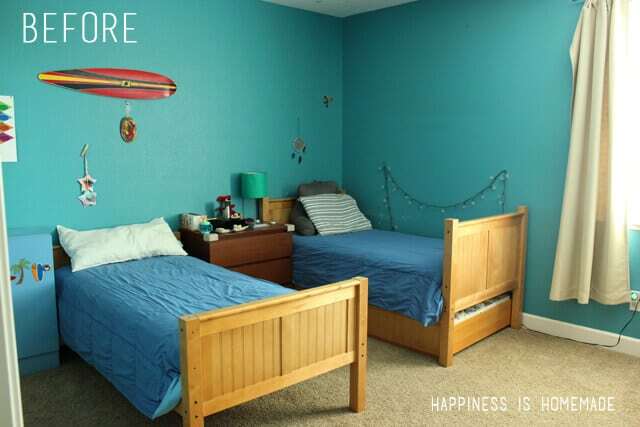 I knew that it was time to do something fun to personalize their room again, so I am embarking on a journey to make over their room spending as little money as possible and using items that we already have in the house as much as I can. 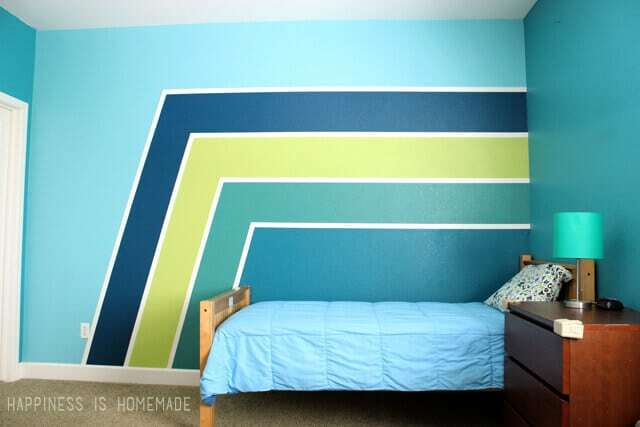 For Phase One of their bedroom makeover, I wanted to liven up their walls and increase the “cool factor,” but I really didn’t want to paint their entire room again. 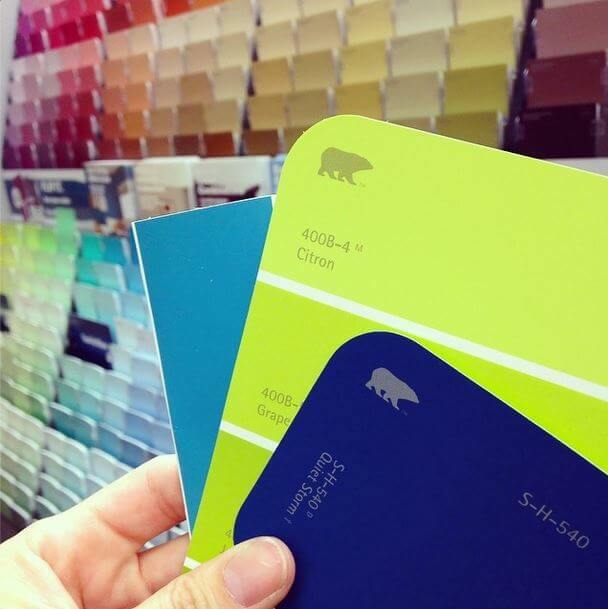 We opted to do a graphic design on the main wall, and I chose two paint colors (Grape Green and Quiet Storm) that complimented their current teal walls (Lagoon). 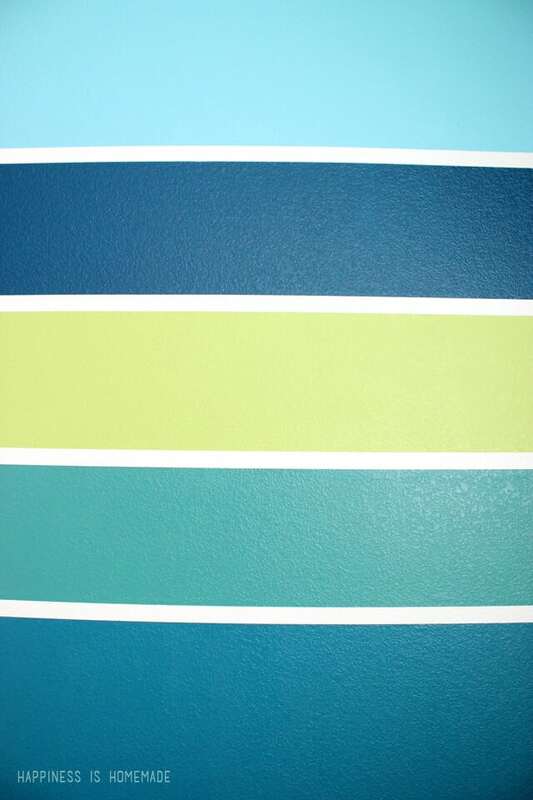 I figured that I could mix all three of the colors + white to get a variety of shades to use on the wall. We started by giving the wall a quick coat of primer. 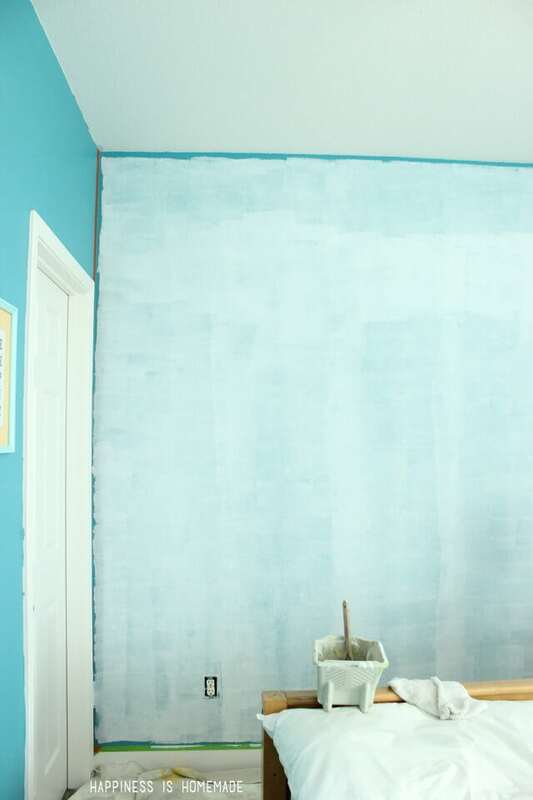 Since our paint colors were still in the same color family, we didn’t worry too much about getting even coverage (just trying to keep the teal from bleeding through that bright Grape Green!). Mitch really wanted to paint a design that was reminiscent of racing stripes, so he grabbed some pushpins and twine to map out his design for me. 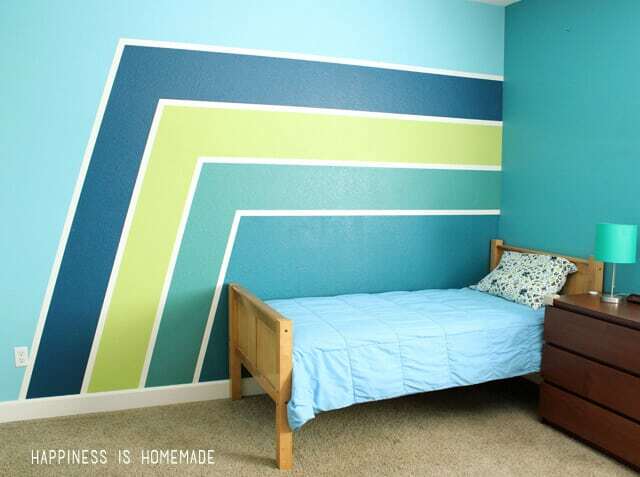 We wanted thin white stripes between our colored bands, so he painted white lines on the wall in the appropriate areas. 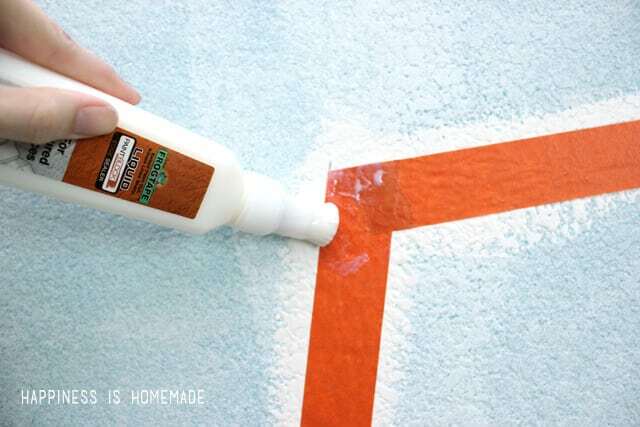 Once the paint was dry, Mitch taped off the white stripes using new Textured Surface Frog Tape. 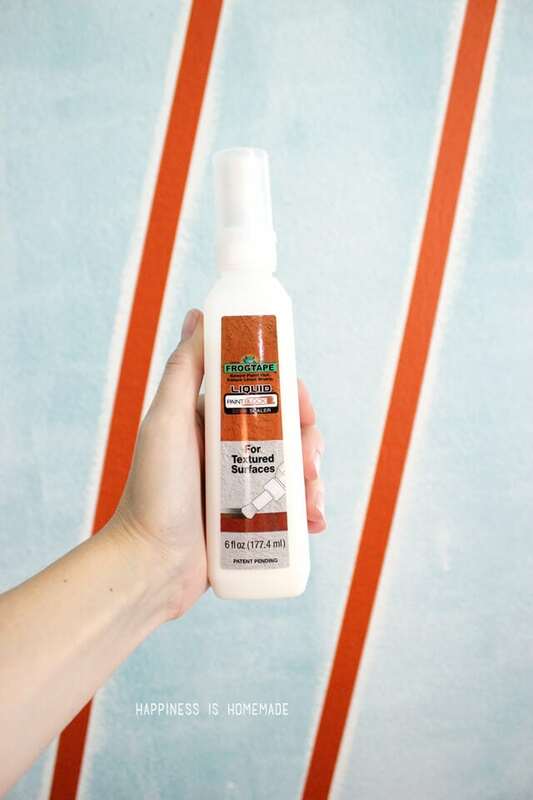 I was really excited to try the FrogTape® Textured Surface™ kit because we have heavy texture on our walls. 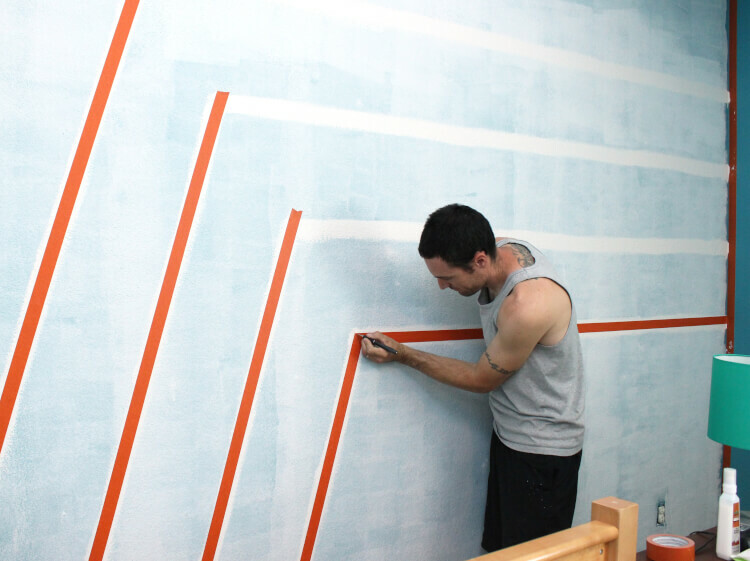 Every time we paint a room, I worry that we’ll end up with funky tape lines and have to do a ton of touch-up, so planning a striped design that required crisp lines had me super nervous! 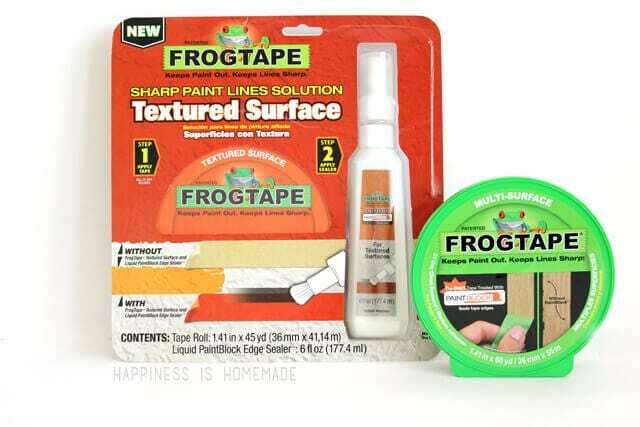 FrogTape® is treated with patented PaintBlock® Technology, a super absorbent polymer that reacts with the water in latex paint and instantly gels to form a micro-barrier that seals the edges of the tape, which helps prevent paint bleed. 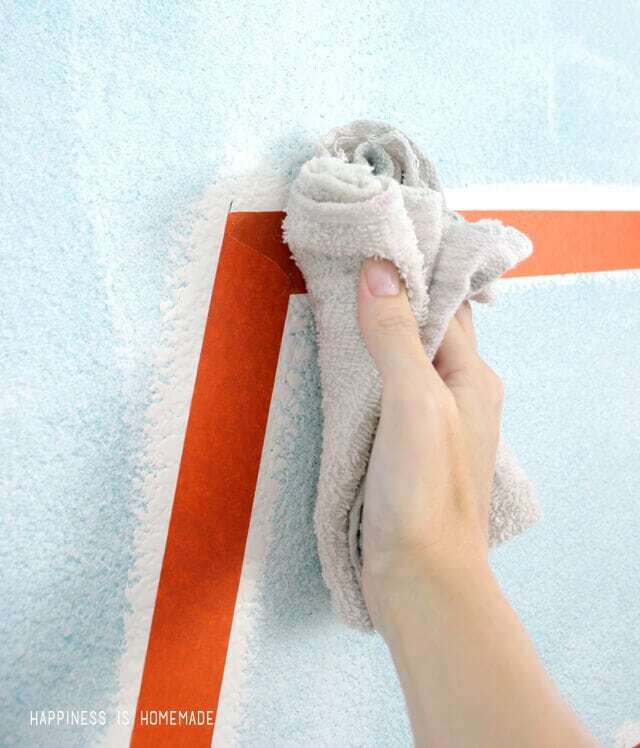 Once you apply the tape to the walls, you can wipe it down with a damp cloth to activate the polymer and seal it in place before you even start painting. 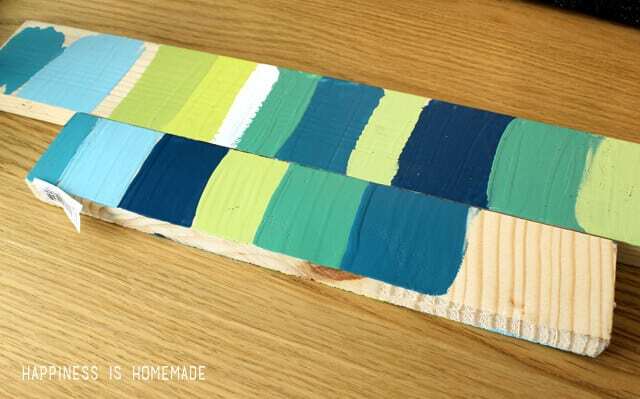 Apply the sealer around the edges of the tape, and wait 15 minutes to it to dry completely. It goes on milky white, but dries crystal clear, so it’s easy to see when you’re ready to paint. While I was waiting for the sealer to dry, I played mixologist and mixed up about a zillion different color options for our stripes. The bright green ended up being a little too yellow-based on its own, so I added a teeny bit of white to help tone it down. We settled on our color choices and got to painting. I started at the bottom; Mitch started at the top, and we worked our way into the middle. 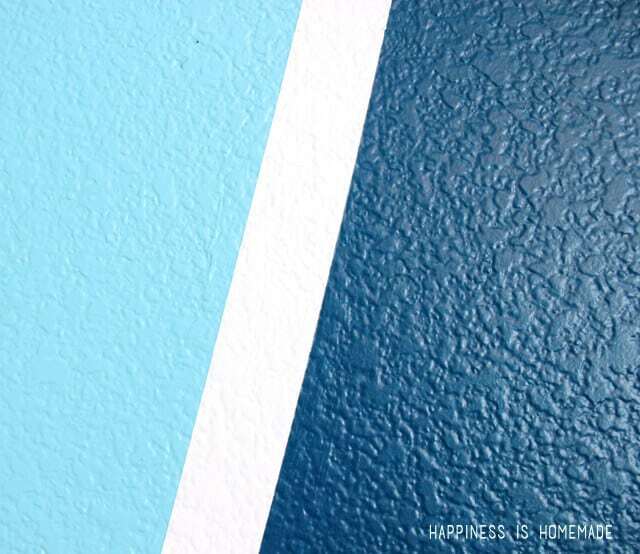 We always peel up the tape as soon as we’re finished painting to avoid any sticking or peeling of paint after it has dried. I was anxiously holding my breath as Mitch peeled the tape off, and I was shocked to see those incredible clean lines! Super duper heavy texture with NO touch ups. Mind blown. 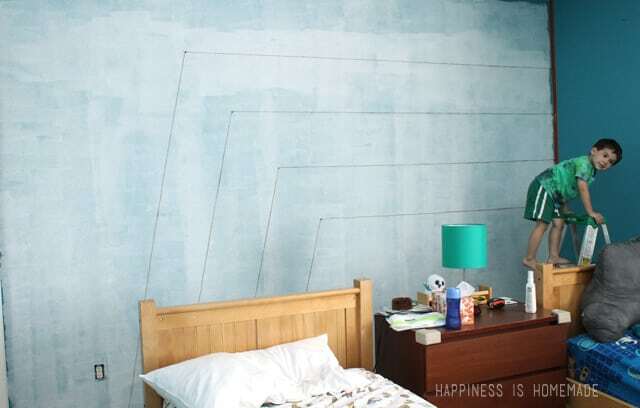 I’m completely in love with how much pizzazz this wall adds to the space! We still have a long ways to go before the makeover is complete, but this is such a fantastic way to start it off! All-in-all there are six different colors on the walls in this room, yet it doesn’t look like too many since the intermixed shades all complement each other really well. It added SO much personality to the room with a teensy budget and a tiny bit of effort…and I didn’t even have to paint the entire room! Click here to learn more about Textured Surface by FrogTape, and be sure to follow the FrogTape Textured Surface board on Pinterest for lots more design inspiration! This looks amazing. We have textured walls as well. So impressed with those clean lines! OH. MY. GOSH! It looks SOOOO GOOD. 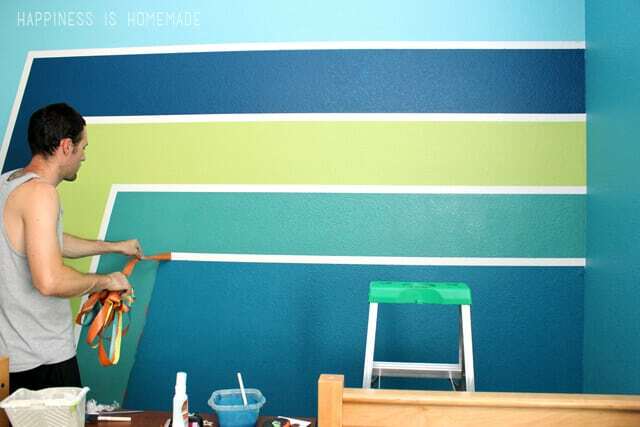 You did an amazing job and oh my gosh that FrogTape works SO WELL on those textured walls. I’m honestly blown away! Wow! I love this room. 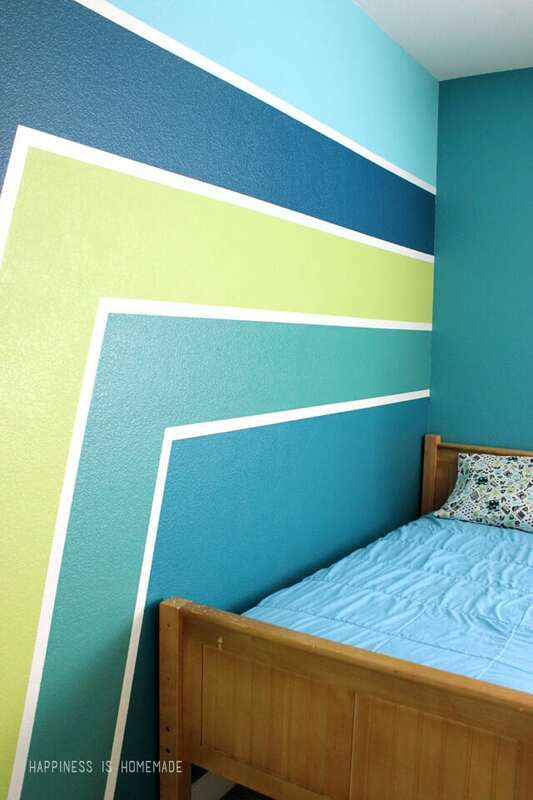 We want to liven up my son’s bedroom and I’d love the names of the colors you chose. would you mind sharing?